If you’ve ever had a project fail, you may be wondering what you can do to avoid wasting time and money in the future. A well-executed bad idea is a huge waste of time and energy. With so much at hand, it’s vital to identify a bad idea as early as possible. So, the question is, how do you identify a good idea from a bad one? Fortunately, we have a tool that allows us to do just that — a prototype. A prototype is an experimental model of an invention or idea that allows companies to test it before fully building the solution. When it comes to prototyping services, there are numerous approaches designers can choose to take. However, there is one particular approach that is faster, and often cheaper, than creating a traditional, full-blown prototype. In this article, we are going to review the concept of rapid prototyping and provide a few tips and recommendations on how to do it. What Exactly Is Rapid Prototyping? Rapid prototyping is a topic that most people do not fully understand. It’s a process of quickly creating the future state of a product and validating it with a group of users, stakeholders, developers, and other designers. 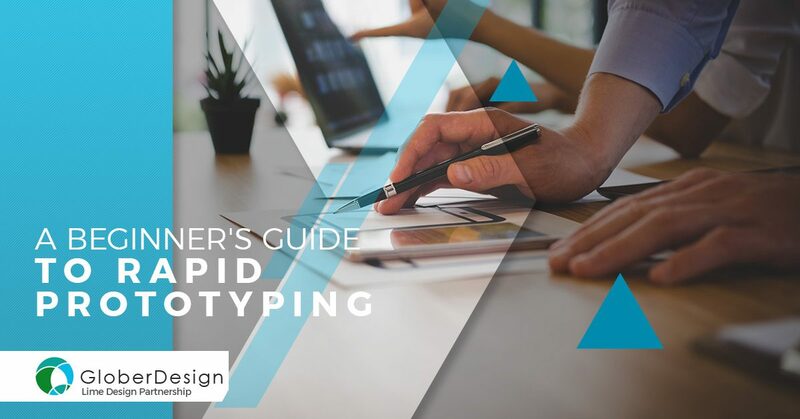 The ‘rapid’ part of rapid prototyping implies that this prototyping approach is quicker, and often cheaper, than creating a traditional prototype. The biggest difference between rapid and traditional prototyping processes is that, with traditional approaches, a team focuses on building one or just enough of a prototype — something that users will be able to test, without additional features. The idea behind rapid prototyping is that by setting a direction for a design team and repeating rapidly, it’s possible to create a product that will have the maximum value for the clientele or targeted consumers. A prototype often starts small by designing a few core parts of a product and grows in broadness and depth over multiple iterations as required areas are created. The finalized version of a prototype is handed off for development. The process of rapid prototyping typically involves three-stages. Prototyping. Creating a solution that can be reviewed and tested. Reviewing. Giving your prototype to users/stakeholders and gathering feedback that helps you understand what works and what doesn’t. Refining. Based on the received feedback, determine areas that need to be refined or clarified. The list of revisions will form a scope of work for your next design iteration. Many rapid prototyping processes produce pieces that are at or near production quality, which can be very beneficial during many stages of the product design processes. Let’s review some of the benefits. Rapid prototyping enables prototyping companies to identify their concepts beyond virtual visualization. This makes it easier to understand the look and feel of the design, rather than simply assuming through a CAD product design, helping carry forward ideas and implement them in their design prior to the finalization. Additionally, rapid prototyping creates proof of the concept for the end client, seeking for a more realistic product design rather than merely looking at it on a computer screen. With the physical model that rapid prototyping provides, it is possible to incorporate the changes instantly simply by receiving feedback from the customers. Before the finalization of the design, there are several iterations that will be needed. The design improves further, with each iterative process, which helps build confidence for the end consumer. This also helps in identifying the actual need of the market, making it possible to develop competitive products with a better acceptance rate. Developing moulds, patterns, and special tools can be costly, but those costs can be eliminated with additive manufacturing. The same CAD software and the printing machines can be used to create different geometries. Unlike conventional prototyping methods such as CNC machining, the amount of waste produced during this process is at a minimum, as rapid prototyping only prints the material that is needed to create the object. One of the most unique benefits of the rapid prototyping process is the ability to develop customized products. Even better, it can do it per individual requirement. Plus, it requires no special tools or processes to employ design changes in the product. Additionally, rapid prototyping makes it easier to experiment with multiple approaches and ideas. It furthers discussion through visuals, which leads to better, faster design. Did You Know? Presenting information in a visual format is the fastest way to create engagement. The materials available for rapid prototyping closely resemble the characteristics and durability of the actual product, making it easy to perform tests. The risks of faults and usability issues can be caught earlier on to avoid problems that may potentially take place further down the road. As you can see, using rapid prototyping in product design and development is a profitable decision and must be encouraged in the manufacturing organization. In a fiercely competitive landscape, this tool can help in creating innovative products cost-effectively. Searching for Rapid Prototyping Companies? At Glober Design, prototyping is just one of our specialties. We have a variety of rapid prototyping processes to meet the needs of your product, including stereolithography, laser sintering, fused deposition modeling, solid ground curing, and laminated object manufacturing. To learn more about our rapid prototyping process and how we can help with your idea, contact us!